Barack Obama issues a stern warning over North Korea’s planned satellite test scheduled for next month. The president’s tough talk comes on the heels of an agreement between the United States and North Korea last month that traded “a moratorium on long-range missile launches, nuclear tests, and nuclear activities at Yongbyon, including uranium enrichment activities” for food aid. Still, the U.S. was careful to greet the deal with only cautious optimism, declaring the agreement a “modest first step in the right direction. We, of course, will be watching closely and judging North Korea's new leaders by their actions." Such caution was possibly wise, as the deal is now potentially already in jeopardy with North Korea’s declaration this month that it intends to launch a satellite, which many defense analysts believe will actually be cover for a test of its ballistic missile technology. There’s also the possibility that the launch could send the rocket soaring over parts of South Asia. U.S. Assistant Secretary of State for East Asian and Pacific Affairs Kurt Campbell, while visiting Sydney, delivered a troubling message to his counterparts in Australia. “If the missile test proceeds as North Korea has indicated, our judgment is that it will impact in an area roughly between Australia, Indonesia and the Philippines,” Campbell declared. 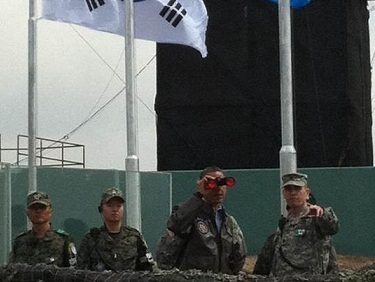 South Korean President Lee Myung-bak, who spoke alongside Obama, declared that Seoul and Washington would “respond sternly to any provocations and threats by the North and to continually enhance the firm South Korea-U.S. defense readiness.” South Korea is also reportedly exploring the possibility of expanding the range of its own ballistic missiles in response to North Korean actions.